Home / Resources / Blog / Sing With Me Baby! When I sing to a group of young children in my music and movement class—ages ranging from 6 months to 2½ years—I’m always amazed by the various reactions I get. One week, the youngest babies just stare in wonder at this crazy lady singing and patting her legs. But another week, they tap their feet to the beat or start to babble as they join in the singing. The more shy members of a group may hide behind their parents, who swear this same child loudly sings at home. Others may sing every word at the top of their lungs while making faces in the mirror. When I share what I do with new parents, many times I hear the responses, “Oh, he’s too young to do anything,” “We plan on joining when she can actually participate,” “How cute; it’s like they understand what you’re singing!” What I started to notice was how difficult it is to understand developmentally appropriate musical expectations and growth for very young children, since this topic is not discussed as much as others. Parents typically hear more about gross motor skill or language development during their child’s earliest years and can more easily recall what basic milestones and expectations are for these domains; but it’s also important to know the milestones and developmentally appropriate musical expectations very young children will meet. Singing to a child is a great way to encourage musical development; but what are some additional ways to support very young children in this developmental milestone? Here are developmentally appropriate expectations for music development for young children of various ages. Newborns should be bathed in song all day long. The most comforting sound in the world is their parents’ voices—especially the mother’s, if they were listening to her for the last nine months. At this stage, they are taking in everything around them, so sing everything! Sing while making a grocery list, sing favorite songs from the radio, sing songs from your own childhood, etc. Infants respond to familiar songs and tunes by smiling, babbling, and repeating the resting tone (the last note the adult sings). They show reactions to songs used throughout the day, such as transition songs, bath time songs, and lullabies. The most common response is intense staring, sometimes smiling! They actively listen, process, and try to figure out what is going on in the song. For instance, singing a tune the child is familiar with, such as “Twinkle Twinkle Little Star,” but changing the words to “Now we’re going to the bath, / You can sit and make a splash!” will have the baby thinking about the new words used and what will happen. 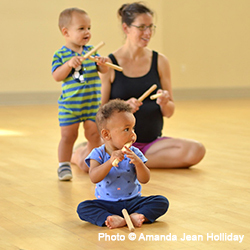 Infants synthesize beats and patterns when adults tap out the rhythm of a song. Older infants and young toddlers show more purposeful responses to music, such as babbling along during a song, tapping their hands or feet with the beat, and shaking rhythmic instruments. Adults should remember to give children space to sing and to repeat sounds. Singing without pause will limit what the child feels he or she can contribute. By the time children are older toddlers—through age 2—they remember the words to familiar songs and sing along, like adults do. They remember the tune of a song and can sing in various pitches. When a rhythm is patted or clapped, toddlers can repeat what they just heard. Parents and caregivers should also keep in mind their children’s individual personalities. Some children are overwhelmed by large groups, choosing to observe rather than participate. Those same children may sing what they’ve heard during music and movement class when they’re back home in a comfortable environment. While it could seem like these children aren’t engaged, it doesn’t mean they’re learning less than their peers! The most important thing during this stage of the child’s development is exposure to music—more active participation will follow. Just like all types of development, musical development varies from child to child, and it is tied to the amount of musical exposure a child has already had. Children’s development is constantly changing! One day a child stares at me silently, and the next day she babbles right along with the group! Keep singing, dancing, and making music with your little one every day! Amanda Holliday, M.Ed., has taught infants-preschoolers full-time in classroom settings ranging from an inner city Headstart program to a University laboratory setting. She teaches ZumbiniⓇ music and movement classes for young children in the DC area along with her favorite dance partner, her own bundle of joy!